Sen. Kirsten Gillibrand (D., N.Y.) acknowledged "human errors" were made in her office's handling of staff sexual misconduct allegations. A female Gillibrand staffer ultimately resigned as a result of what she said was the mishandling of her complaint. Gillibrand, while campaigning in Iowa for the 2020 Democratic nomination on Tuesday, responded to the fact a male aide was fired after Politico presented additional information about the allegations. "We decided that because of some post-investigation human errors that future investigations should be done by our new chief of staff, who actually has experience in this area," Gillibrand said, per the Associated Press. "If there are ways to improve, we certainly will. We always have taken this seriously and investigated it thoroughly and treated every person who’s come forward with the respect and dignity they deserve," she added. Earlier this month, Politico reported that a young staffer resigned last summer over what she called a poor handling of a sexual harassment complaint she made against a senior, male aide. 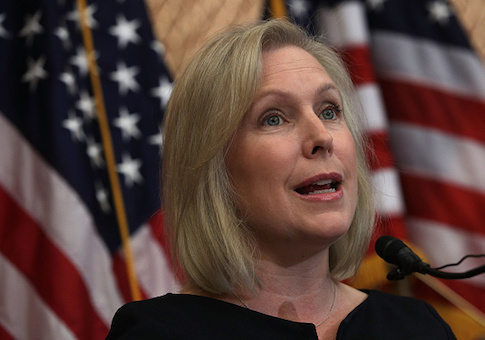 "When I had the courage to speak up about my harasser, I was belittled by her office and treated like an inconvenience," the woman said of Gillibrand. "She kept a harasser on her staff until it proved politically untenable for her to do so." The woman alleged Gillibrand's longtime aide Abbas Malik made repeated, unwelcome advances toward her. She quit her job less than three weeks after reporting the harassment because of how the matter was investigated. Gillibrand's office dismissed Malik after Politico presented more evidence of misconduct. She previously defended her handling of the situation. "We took these allegations very seriously," Gillibrand said last week. "We opened an investigation immediately, and we did a thorough investigation. We did not find sexual harassment, but we did find derogatory comments, and the employee was punished for those derogatory comments." Politico found Gillibrand's office did not interview former employees about Malik's behavior, despite the staffer who resigned recommending certain employees they should contact. "Your office chose to go against your public belief that women shouldn't accept sexual harassment in any form and portrayed my experience as a misinterpretation instead of what it actually was: harassment and, ultimately, intimidation," the young staffer wrote in her resignation letter.